When going somewhere for the first time I always check what the situation is like with resupplies. I want to know if I have a chance to be in a big grocery store or only tiny village shops. Some countries are better in the gluten-free area than others – I read forums and advice from other travelers. If I travel to a place where people speak a language I don’t – I prepare some info in the local language about my diet. Thanks to this website, I have a one-page info on my diet that I can show in a restaurant. I used them already a few times when I was hiking in Catalonia and on Crete – I can highly recommend downloading and having it ready on your phone or kindle. I generally don’t trust I can find all I need out there. So even if I can resupply, I have some basic staples with me for the whole trip. Which means that, yes, sometimes I carry 3 week worth of food on me. I know I can find fresh fruits, canned fish or coffee with no problem wherever I go but GF oats or rice noodles are much more of a problem. Oatmeal is my meal to go. I make it by myself at home. This way I can make it in bulk, add what I like and cut on expenses. I don’t divide it into day portions because that way it would take more space in my bag. I generally make two big bags, which are heavy but can get me through three weeks of hiking with no resupply needed. This approach is necessary if you I plan on hiking in more wild places or only stop in small villages where finding gluten-free oatmeal or bread is close to impossible. When I was recently hiking on Crete, I couldn’t find gluten-free items anywhere, other than pasta, which was useless to me anyway, as I didn’t want to cook it for 12 min. If you want to check what I add to my oatmeal to make it not only filling but also delicious, check this post. It, of course, changes with each time a bit, but the main items stay the same: gluten-free oats, rice flakes, dehydrated full-fat milk, dried fruits, and seeds. Last time I added dried dates it was the best idea ever! I am allergic to most nuts and fresh fruits which is limiting but if you can eat them – nuts are the perfect trail snack as are apples or baby carrots. For my last hiking trip to Crete, I created my own Trail Mix. I threw whatever I could: GF pretzels (salt is necessary! ), M&Ms (peanut and regular), seeds (sunflower, pumpkin), dried fruits (banana slices, apricots), and… gummie bears ;-) I made it a big bag and each day was taking a handful into a smaller bag to munch on along the trail. If you like to play around in your kitchen, you can create your own trail energy bars (or balls) - they are generally made of a mixture of nuts, dates, dried fruit, and coconut or such. I am rather lazy so I don't even check recipes for that. You could also bake your own oatmeal cookies. The basic set-up is one cup of oats for one banana. Then you add whatever you want. I was experimenting with this and no matter what I added the result was delicious. Try adding peanut butter, cocoa, nuts, dried fruits, chia seeds and so on. Perfect snack directly from your kitchen! For the first day or two (if the weather isn't too hot) you can also grab hard-boiled eggs from home or whatever accommodation you stay at. Eggs are the perfect gluten-free trail food - high in protein and healthy fats, ready to eat and delicious. This is one can be a challenge. You can go with the ready-made gluten-free hiker meals, which are dehydrated and only require hot water. I find them bulky and horribly expensive. I could grab one or two for a short weekend trip but can’t imagine living on them for three weeks or such. There would be no way to fit them all in my bag! Some people suggest repackaging them – to squeeze all the air out but I think it’s still not enough. Another trick I saw somewhere is buying regular instant ramen-style soups, throwing away the noodles and just taking the soup pockets to use with rice noodles. This doesn’t sound like a bad idea but I hate throwing away food. If you have someone who would love to use the ramen separately – then it might be a good idea. I go with a bit different setup. As a base, I use rice noodles or rice flakes (they cook fast). I often try to break the rice noodles a bit as they take a lot of space. Rice flakes are better in that - they are densely packed and easier to pack in my backpack. Using dehydrated potatoes is also an awesome meal idea - you can just add water and then drop in some high-protein or high-nutrition add-ons like sausage, dehydrated veggies or hard-boiled eggs. You could also use pre-cooked rice just to warm up – it’s heavier but not an issue for short trips. There are great options out there, just bare in mind that they are made to be warmed up in the microwave ovens, so they could be a bit dry from just warming up in a hot water. I don’t cook my meals; I just use hot water to soak in. But if you want to cook – you can also take some GF corn pasta or similar. This is particularly useful when you go for shorter, weekend trips and can take more food with you - if you like to prepare gourmet meals while camping, you can create some awesome dishes. For the rest – I found individual pockets of dehydrated soup, called Protein Gusto, that I use. I found them in an online store and they are made by BioTeachUSA for weightlifting folks. They have an extra amount of protein (about 16-18g/portion) but very little fat (which isn’t perfect for hiking). Just FYI - I found the broccoli soup absolutely disgusting. So you know ;-) but the tomato and cheese flavors are awesome. The packages are small and I can take with no problem 30 or 40 for a longer trip. Whenever I can, I try to add something more to this mixture – sausage or cheese for example. Some people like to take a small bottle of olive oil, which might also be a good idea. I also found small bags of dehydrated vegetables which I sometimes add to make them more nutritious although I don’t worry about that much and neither should you. A few days of sub-perfect eating won’t do much damage to our system. If you are planning for a long through-hike proper nutrition is much more of an issue and you should look more carefully at the nutrients. Sometimes I also take single pockets of dry gluten-free soup, although they have very little nutritional value so I try adding other things to it (olive oil or sausage) to make sure I have some protein and healthy fats in me. Our performance will suffer if we don't eat enough fat and protein. It's pretty easy to keep our carbohydrates intake high but we need to be conscious about eating healthy fats (nuts, dried meat, cheese, olive oil) and protein (beans, sausage, dairy products, protein bars). If you are looking for a few tips on how to build your backpacking kitchen - click over to this post - you can see what the options are and what is best for your needs. Just take a look at the choices in backpacking stoves you have! 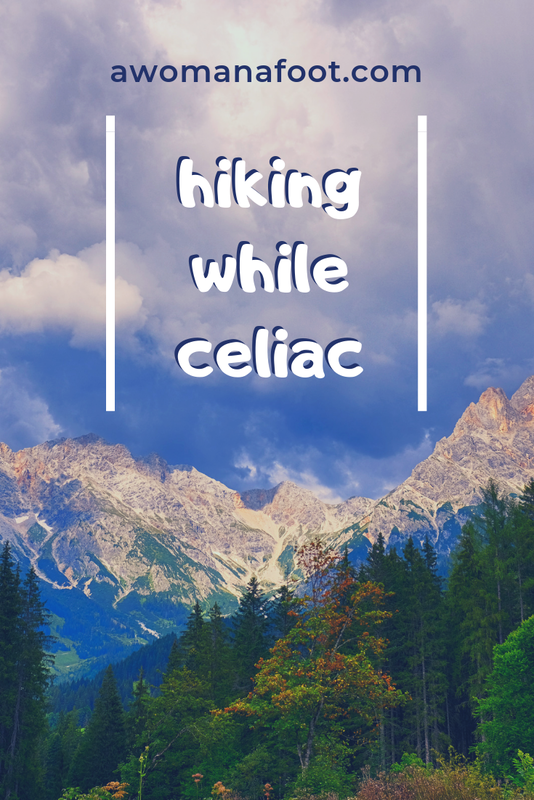 What are your tricks and hacks for gluten-free hiking? Do you have any recipes to share?